Sodium and fluorine undergoing a redox reaction to form sodium fluoride. Sodium loses its outer electron to give it a stable electron configuration, and this electron enters the fluorine atom exothermically. The oppositely charged ions – typically a great many of them – are then attracted to each other to form a solid. Ionic bonding is a type of chemical bond that involves the electrostatic attraction between oppositely charged ions, and is the primary interaction occurring in ionic compounds. The ions are atoms that have gained one or more electrons (known as anions, which are negatively charged) and atoms that have lost one or more electrons (known as cations, which are positively charged). This transfer of electrons is known as electrovalence in contrast to covalence. In the simplest case, the cation is a metal atom and the anion is a nonmetal atom, but these ions can be of a more complex nature, e.g. molecular ions like NH4+ or SO42−. In simpler words, an ionic bond is the transfer of electrons from a metal to a non-metal in order for both atoms to obtain a full valence shell. It is important to recognize that clean ionic bonding – in which one atom or molecule completely share an electron from another – cannot exist: all ionic compounds have some degree of covalent bonding, or electron sharing. Thus, the term "ionic bonding" is given when the ionic character is greater than the covalent character—that is, a bond in which a large electronegativity difference exists between the two atoms, causing the bonding to be more polar (ionic) than in covalent bonding where electrons are shared more equally. Bonds with partially ionic and partially covalent character are called polar covalent bonds. Ionic compounds conduct electricity when molten or in solution, typically as a solid. Ionic compounds generally have a high melting point, depending on the charge of the ions they consist of. The higher the charges the stronger the cohesive forces and the higher the melting point. They also tend to be soluble in water. Here, the opposite trend roughly holds: the weaker the cohesive forces, the greater the solubility. Atoms that have an almost full or almost empty valence shells tend to be very reactive. Atoms that are strongly electronegative (as is the case with halogens) often only have one or two empty orbitals in their valence shell, and frequently bond with other molecules or gain electrons to form anions. Atoms that are weakly electronegative (such as alkali metals) have relatively few valence electrons that can easily be shared with atoms that are strongly electronegative. As a result, weakly electronegative atoms tend to distort their electrons cloud and form cations. Ionic bonding can result from a redox reaction when atoms of an element (usually metal), whose ionization energy is low, give some of their electrons to achieve a stable electron configuration. In doing so, cations are formed. The atom of another element (usually nonmetal), whose electron affinity is positive, then accepts the electron(s), again to attain a stable electron configuration, and after accepting electron(s) the atom becomes an anion. Typically, the stable electron configuration is one of the noble gases for elements in the s-block and the p-block, and particular stable electron configurations for d-block and f-block elements. The electrostatic attraction between the anions and cations leads to the formation of a solid with a crystallographic lattice in which the ions are stacked in an alternating fashion. In such a lattice, it is usually not possible to distinguish discrete molecular units, so that the compounds formed are not molecular in nature. However, the ions themselves can be complex and form molecular ions like the acetate anion or the ammonium cation. However, to maintain charge neutrality, strict ratios between anions and cations are observed so that ionic compounds, in general, obey the rules of stoichiometry despite not being molecular compounds. For compounds that are transitional to the alloys and possess mixed ionic and metallic bonding, this may not be the case anymore. Many sulfides, e.g., do form non-stoichiometric compounds. The salt NaCl is then said to consist of the acid rest Cl− and the base rest Na+. Representation of ionic bonding between lithium and fluorine to form lithium fluoride. Lithium has a low ionization energy and readily gives up its lone valence electron to a fluorine atom, which has a positive electron affinity and accepts the electron that was donated by the lithium atom. The end-result is that lithium is isoelectronic with helium and fluorine is isoelectronic with neon. Electrostatic interaction occurs between the two resulting ions, but typically aggregation is not limited to two of them. Instead, aggregation into a whole lattice held together by ionic bonding is the result. The removal of electrons from the cation is endothermic, raising the system's overall energy. There may also be energy changes associated with breaking of existing bonds or the addition of more than one electron to form anions. However, the action of the anion's accepting the cation's valence electrons and the subsequent attraction of the ions to each other releases (lattice) energy and, thus, lowers the overall energy of the system. Ionic bonding will occur only if the overall energy change for the reaction is favorable. In general, the reaction is exothermic, but, e.g., the formation of mercuric oxide (HgO) is endothermic. 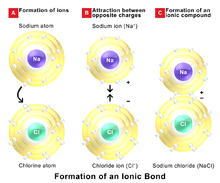 The charge of the resulting ions is a major factor in the strength of ionic bonding, e.g. a salt C+A− is held together by electrostatic forces roughly four times weaker than C2+A2− according to Coulombs law, where C and A represent a generic cation and anion respectively. Of course the sizes of the ions and the particular packing of the lattice are ignored in this simple argument. For a solid crystalline ionic compound the enthalpy change in forming the solid from gaseous ions is termed the lattice energy. The experimental value for the lattice energy can be determined using the Born-Haber cycle. It can also be calculated (predicted) using the Born-Landé equation as the sum of the electrostatic potential energy, calculated by summing interactions between cations and anions, and a short-range repulsive potential energy term. The electrostatic potential can be expressed in terms of the inter-ionic separation and a constant (Madelung constant) that takes account of the geometry of the crystal. The further away from the nucleus the weaker the shield. The Born-Landé equation gives a reasonable fit to the lattice energy of, e.g., sodium chloride, where the calculated (predicted) value is −756 kJ/mol, which compares to −787 kJ/mol using the Born-Haber cycle. Ions in crystal lattices of purely ionic compounds are spherical; however, if the positive ion is small and/or highly charged, it will distort the electron cloud of the negative ion, an effect summarised in Fajans' rules. This polarization of the negative ion leads to a build-up of extra charge density between the two nuclei, i.e., to partial covalency. Larger negative ions are more easily polarized, but the effect is usually important only when positive ions with charges of 3+ (e.g., Al3+) are involved. However, 2+ ions (Be2+) or even 1+ (Li+) show some polarizing power because their sizes are so small (e.g., LiI is ionic but has some covalent bonding present). Note that this is not the ionic polarization effect that refers to displacement of ions in the lattice due to the application of an electric field. In ionic bonding, the atoms are bound by attraction of opposite ions, whereas, in covalent bonding, atoms are bound by sharing electrons to attain stable electron configurations. In covalent bonding, the molecular geometry around each atom is determined by valence shell electron pair repulsion VSEPR rules, whereas, in ionic materials, the geometry follows maximum packing rules. One could say that covalent bonding is more directional in the sense that the energy penalty for not adhering to the optimum bond angles is large, whereas ionic bonding has no such penalty. There are no shared electron pairs to repel each other, the ions should simply be packed as efficiently as possible. This often leads to much higher coordination numbers. In NaCl, each ion has 6 bonds and all bond angles are 90 degrees. In CsCl the coordination number is 8. By comparison carbon typically has a maximum of four bonds. Purely ionic bonding cannot exist, as the proximity of the entities involved in the bonding allows some degree of sharing electron density between them. Therefore, all ionic bonding has some covalent character. Thus, bonding is considered ionic where the ionic character is greater than the covalent character. The larger the difference in electronegativity between the two types of atoms involved in the bonding, the more ionic (polar) it is. Bonds with partially ionic and partially covalent character are called polar covalent bonds. For example, Na–Cl and Mg–O interactions have a few percent covalency, while Si–O bonds are usually ~50% ionic and ~50% covalent. Pauling estimated that an electronegativity difference of 1.7 (on the Pauling scale) corresponds to 50% ionic character, so that a difference greater than 50% corresponds to a bond which is predominantly ionic. Ionic character in covalent bonds can be directly measured for atoms having quadrupolar nuclei (2H, 14N, 81,79Br, 35,37Cl or 127I). These nuclei are generally objects of NQR nuclear quadrupole resonance and NMR nuclear magnetic resonance studies. Interactions between the nuclear quadrupole moments Q and the electric field gradients (EFG) are characterized via the nuclear quadrupole coupling constants QCC = e2qzzQ/h where the eqZZ term corresponds to the principal component of the EFG tensor and e is the elementary charge. In turn, the electric field gradient opens the way to description of bonding modes in molecules when the QCC values are accurately determined by NMR or NQR methods. In general, when ionic bonding occurs in the solid (or liquid) state, it is not possible to talk about a single "ionic bond" between two individual atoms, because the cohesive forces that keep the lattice together are of a more collective nature. This is quite different in the case of covalent bonding, where we can often speak of a distinct bond localized between two particular atoms. However, even if ionic bonding is combined with some covalency, the result is not necessarily discrete bonds of a localized character. In such cases, the resulting bonding often requires description in terms of a band structure consisting of gigantic molecular orbitals spanning the entire crystal. Thus, the bonding in the solid often retains its collective rather than localized nature. When the difference in electronegativity is decreased, the bonding may then lead to a semiconductor, a semimetal or eventually a metallic conductor with metallic bonding. ↑ L. Pauling The Nature of the Chemical Bond (3rd ed., Oxford University Press 1960) p.98-100.